The New York Red Bulls have completed the transfer of Argentine attacking midfielder Alejandro "Kaku" Romero Gamarra from Club Atletico Huracan pending receipt of his P-1 visa and ITC, the club announced today. Gamarra will be the first Young Designated Player in club history and occupy an international roster spot. At 23, Gamarra is already in his fifth professional season. He signed with Club Atletico Huracan's senior team in July of 2013, and made his professional debut in the second half of the 2014/15 season. He helped the club earn promotion to Argentina's top division in 2015. "We are very pleased to reach an agreement with all parties and complete this deal," said Sporting Director Denis Hamlett. "When we identified Kaku, he quickly became our top off-season target. He fits the profile of the player we are looking for: highly skilled, creative, and hard-working. During our discussions, we realized that we are adding a good player and great young man to our team. We look forward to seeing him continue to grow as part of the New York Red Bulls." 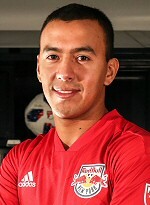 The Ciudadela, Argentina, native began his professional career with CA Huracan at age 18. Over four and a half seasons, Gamarra has appeared in 95 matches and recorded eight goals and 13 assists. In the first half of the 2017/18 season he tallied one goal and three assists in 12 matches over 822 minutes. "Kaku is a very exciting player and a great person," said Red Bulls head coach Jesse Marsch. "He is a creative, dynamic attacker who can change the game by scoring and setting up teammates. He has an excellent grasp of the game and I think he will thrive in our style of play. He is ecstatic to be joining us and we can't wait to get to work." Alongside his club credentials, Gamarra has represented Argentina at youth levels through Under-20. He appeared in three matches during the 2015 U-20 World Cup, starting one.